Starting at 6:30 the protest lasted four hours. Rosaries were prayed in English and Vietnamese. 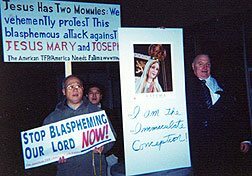 When we found out that the blasphemous production, “Jesus Has Two Mommies” was playing in Portland Oregon on December 1, we knew immediately that we had to protest. It was a point of honor, We can not let Our Lady and the Holy Family go undefended. So, after gathering some necessary materials, I scheduled a flight and left for Portland the following day. During the next two days, all efforts to make contacts failed, church offices were closed and not returning calls. It was the Thanksgiving weekend and I was getting nowhere. By Saturday evening, November 27, things were not looking good, but when I went to a Catholic church in the area of the theater, I met a young Vietnamese man with a bandaged hand. When I gave him a flyer about the rally he invited me to the Vietnamese Catholic church close by. With the cooperation of the pastor who announced our rally from the pulpit at each Mass, I was able to distribute thousands of flyers to his parishioners. I saw this as an intervention of Our Lady. On the night of the rally, the majority of participants were Vietnamese. Mr. McAndrews presence contributed greatly to the success of the rally. Another bright spot during this episode occurred when our good friend, an America Needs Fatima Child of Mary, Bruce Mc Andrews flew in from Pennsylvania. His presence contributed very much to the success of the rally. He helped with the preparations and led the Rosary despite threats of violence from a drunk and disorderly man who approached from the direction of the theater during the protest. He shouted at Mr. McAndrews to stop repeating the Hail Mary and put his finger in Mr. McAndrews face. At this point I called 911, but Mr. Mc Andrews continued calmly but loudly over the bull horn, praying the decades of the Rosary with great effectiveness. When the belligerent man realized I had called 911, he fled into the cold darkness of the night. In spite of the incident the protest ran the course of four hours starting at 6:30 p.m. 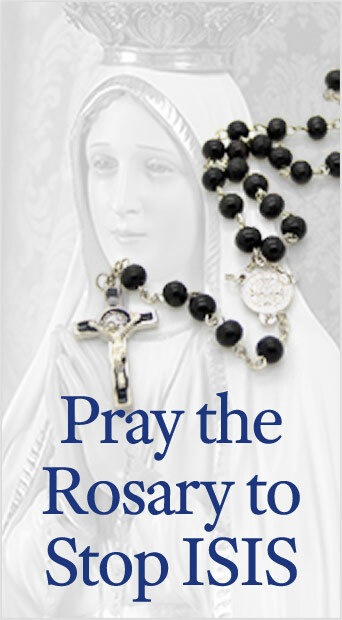 The rosary was said in English and Vietnamese Many hymns and prayers of praise and adoration were intoned. Reparation was made and the Holy Family defended. Thanks be to God. 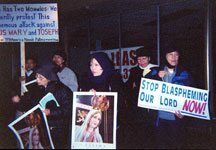 This entry was posted in Events of 2004 and tagged anti-blasphemy by Edward Ritchie. Bookmark the permalink.